We’re pleased that one of our very own dentists was the guest on CTV Morning Live’s “Ask An Expert” segment on November 17, 2016. 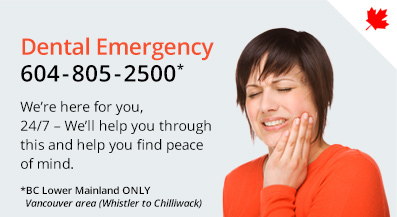 Dr. Alison Fransen, owner of Wesbrook Village Dental Centre, a dental clinic at UBC, provided tips for protecting your teeth during sports (and emergency tips if you lose a tooth) in a video segment with Keri Adams. Keri Adams: Losing a tooth can be part of the game when it comes to full contact sports. Here, with tips on how to keep your pearly whites protected, is Dr Alison Fransen from Wesbrook Village Dental Centre. Good to see you. KA: Thanks for coming in, and I find this stat shocking – that more than 5 million teeth are knocked out every year in North America, and mostly because of contact sports. AF: Yeah, you can’t see an accident coming, so it’s good to wear protection. 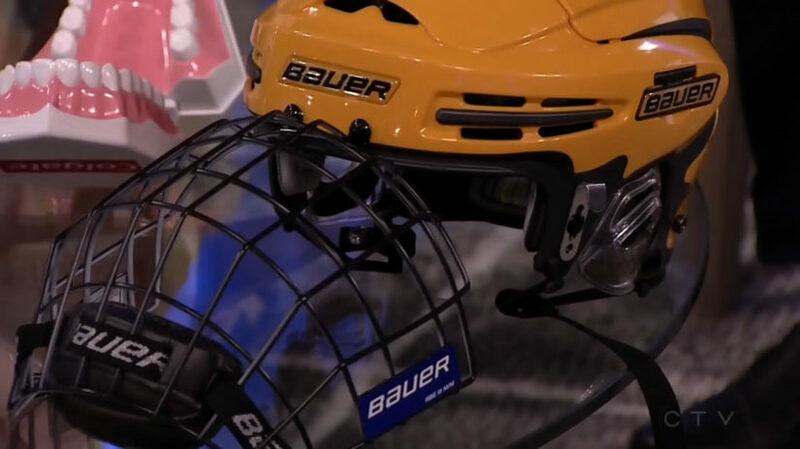 We have for biking, you wear a full faceguard (gesturing to helmets), and for hockey a faceguard as well helps. KA: Okay so when we talk—when you’re in contact sports, I mean, obviously, there’s physicality to those games. And so, I mean I think it’s natural to think that you want to be able to protect yourself, but are there a lot of people who don’t wear face guards and that kind of thing to protect themselves? KA: You see a lot of that coming in? AF: Many injuries. The top are basketball, hockey, and biking. AF: Those are the top 3. But then as well… lacrosse, soccer, because you don’t just have to have a flying object hit you in the face – it can be if you fall or get an elbow in the face. It knocks out your teeth, too. KA: Yikes, okay… so, you talked a little bit about – we are seeing some helmets here – so, this is a biking helmet. Would this protect you? KA: What are they made out of? AF: Yep, they’re soft, flexible, and you can also get extra little tabs on the bottom to reposition your jaw to maximize the air intake to improve your performance in your sport. KA: Okay, so you would uh use those when you’re playing your sports – top and bottom or just one or the other? AF: Yeah, unless you’re doing something extremely severe like boxing. With that you might wear both. KA: Alright, and you did show the hockey helmet. So, do a lot of people wear the faceguards, are you finding that? AF: A lot of people do nowadays. Especially with hockey, they’re not like Doug Gilmore anymore, who lost all his front teeth in the old days. KA: Yeah okay, so a faceguard will help. And what steps should someone take if they do lose a tooth when they’re playing a sport? AF: If you completely lose a tooth, time is of the essence and you have to get to the dentist right away. If you have milk on hand you can put it in milk, or you can tuck it into your mouth if you’re not too squeamish about it and get to the dentist right away so they can reimplant it and splint it. KA: Is that just to keep it warm? KA: Okay. because you’re going to lose that one anyway. AF: Yeah, you’re going to lose it, and it can damage the adult tooth that’s growing underneath if you try to shove it back in. KA: That’s interesting! A lot of people may be surprised to know that if they save the tooth that it could be implanted again. AF: Yes it can, if it comes out whole. But you have to see a dentist right away, and the sooner, the better. KA: So, find the tooth, put it in a cup of milk, or put it in your mouth and get to the dentist stat. AF: Your mouth, yeah, and the dentist right away, yeah. And even little chips or fractures you should see the dentist right away too because it could develop into further problems if you don’t. KA: Alison, good advice this morning!